I RECENTLY ORDERED A MEMORIAL BRACELET FROM YOUR SITE. I HAVE SEEN THEM AROUND AN HAD TO GET ONE FOR MY BROTHER. WELL HE IS NOT MY REAL BROTHER , HE IS MY BROTHER FROM ANOTHER MOTHER. I REALLY MISS HIM ALOT. HE WAS KILLED IN KARBALA, IRAQ. 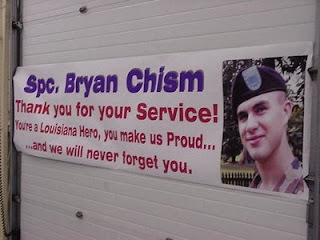 HE WAS KIDNAPPED AN MURDERED WITH A FEW OTHER SOLDIERS, HE DIED JANUARY 20,2007. I APPRECIATE WHAT YOU DO FOR THE ONES WHO LOST THERE LOVED ONES.